Does your organization give back? If corporate social responsibility isn’t already central to your core business strategy, the time has come to make it a priority. Believe it or not, positive social change and good business sense can work hand in hand – and giving back can benefit your organization in more ways than one. According to Forbes, “In today’s world, consumers want to do business with companies that are socially minded. In fact, most people would rather patronize a business that is also serving the community in some way, in addition to making a profit.” Here is a closer look at how doing good can benefit your bottom line – and how fellow B Corporation, Eminence Organic Skin Care, puts corporate social responsibility front and centre. But, how do you measure CSR? One benchmark is B Corporation Certification – the only global certification that measures a company’s entire social and environmental performance. Certified B Corporations are for-profit businesses that are committed to making a difference by using business as a force for good. These organizations voluntarily meet higher standards of transparency, accountability and performance, and are legally required to consider the social and environmental impact of their actions. The goal, as defined by B Corporation, is “to redefine success in business and build a more inclusive and sustainable economy.” To date, the B Corp community includes more than 2,600 companies, across 150 industries, in 60 countries worldwide. In 2016, Vancouver-based company Eminence Organic Skin Care became the first professional skin care brand in Canada to be certified as a B Corporation®. Here is how this award-winning organization infuses CSR into its everyday business practices. One way to create positive change is by aligning with philanthropic causes that benefit the local and/or global community. Choosing a cause and donating your organization’s time, effort and expertise can make a world of difference and leave a lasting impact. 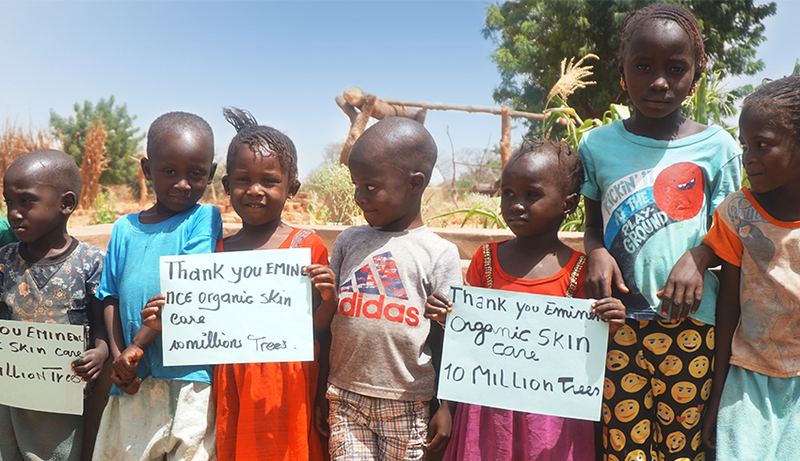 Eminence Organic Skin Care connects profits to the greater good through two philanthropic initiatives: The Eminence Kids Foundation and Forests For The Future. A portion of the proceeds from every Eminence Organics product is donated to the company’s charity, The Eminence Kids Foundation. Company President Boldijarre Koronczay and General Manager Attila Koronczay started the Eminence Kids Foundation in 2013 with the goal of providing seriously ill children with organic, locally sourced and nutrient-rich foods to aid in their recovery and long lasting health. To date, Eminence Kids has donated over 70,000 organic meals to children undergoing treatment in long-term care facilities in Canada, Hungary and the United States. Eminence Organic Skin Care also plants a tree for every product sold. Through its Forests For The Future program and in partnership with award-winning tree planting organization Trees For The Future, Eminence Organics has planted over 11 million trees in more than 22 countries around the world. This has a powerful impact. In developing countries, it equips local people to grow their own food and build sustainable incomes for their families. In addition, climate-smart agroforestry practices contribute to improving crop yields and revitalizing soil health, water use efficiency and carbon storage. Companies that engage in successful CSR prioritize the environment and are committed to finding eco-friendly solutions in every aspect of business. Attila Koronczay says: “We believe there’s a responsibility that every business has to protect and heal the Earth. After all, we want future generations to enjoy our planet just as much as their ancestors.” Eminence Organics employs green practices at every level of of the organization, from its ingredient farms to its central office. Since its inception in 1958, Eminence Organic Skin Care has used sustainable farming and green practices to create its award-winning natural, organic and Biodynamic® skin care. Its premium ingredients are sourced from organic and biodynamic farms worldwide, and its products are formulated without chemical additives like parabens, petrolatum, mineral oils, propylene glycol or sodium lauryl sulfate that are harmful to the environment. Products are handmade without severe heating or hydrogenating processes, and all packaging is made from post-consumer recycled material. These green practices extend to Eminence Organics’ central office in Vancouver, British Columbia. The office was designed as an eco-friendly building, using environmentally-friendly alternatives wherever possible. The company recycles, composts and reduces energy and water consumption at both its central office and warehouse facilities (even packing peanuts are 100% biodegradable). And, Eminence Organics extends the benefits of being eco-friendly to its staff, providing a green transportation incentive that has led to 92% of employees walking, biking or taking public transit to work. Has your business incorporated CSR into its core business strategy? Learn more about how Eminence Organic Skin Care uses business as a force for good, and share your tips with us in the comments below.